Andreas Heuser is an autodidact. After his years as a beginner followed a classical and jazz guitar studies and many years of practical work with non-european (especially oriental) music. These stations are the most important of his musical career that have shaped both – his compositions and his playing technique. He is a unique composer, a skilful player and improviser who has a wide range of expression and performance techniques. Impressive is the tonal richness of 6- and 10-strings classical guitar, steel strings with 6 and 8 strings, requinto (Quint Guitar), electric guitar, Glissentar and electric violin are the tools of this musician. 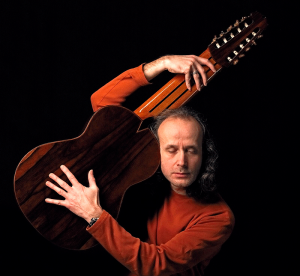 The extra bass strings of the 8- and 10- strings and the high position of requinto expand the familiar sound spectrum and open Andreas Heuser new compositional and playing techniques that he knows how to use. Andreas Heuser is active as a soloist and in various intercultural ensembles. Especially with his Transorient-Orchestra he has gained an international recognition.